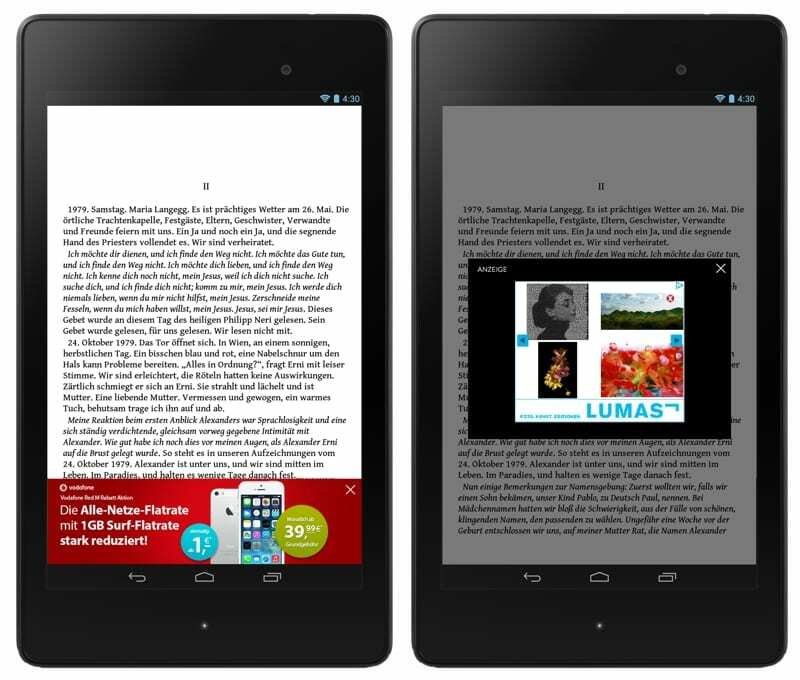 Will readers be willing to subject themselves to ads just to read free ebooks? Readfy set out to answer that question today. This "Spotify for ebooks" opened to the public today, launching a beta test for their ebook subscription service. The ads interrupt the reading experience and are displayed over the text, including both as a footer and centered in the middle of the screen. They also require that readers stay online so the reading app can stay connected with the ad server. Readfy plans to offer text, image, and video ads which will be sold via an ad network at first; the startup would like to launch their own direct ad sales in the near future. They are also going to release an iOS app later this year, and they are working on plans for paid services that will have fewer ads and, at a premium price of 10 euros per month, be completely ad-free and offer an offline reading mode. And that's not all that might be coming. Once Readfy has worked out the bugs they will be doubling the catalog to 30,000 titles, and they already have their sights set on international expansion. In 2015 the service is expected to expand to other European countries and the US. And of course Readfy plans to add English-language and Spanish-language books to their catalog. 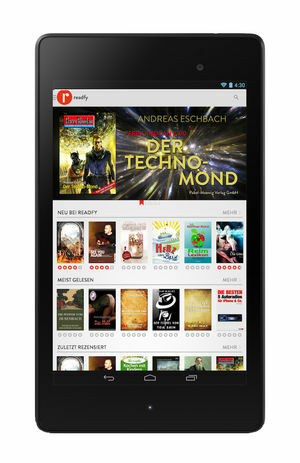 Readfy, which is affiliated with the Dusseldorf-based 1stMover startup incubator, was founded about 7 months ago by Felix Bauchspiess, Ryan David Mullins, and Frank Großklaus. It first came to my attention last November, but has been operating in stealth mode both before and since. So do you think this service will prove to be popular? I don't think so, but then again I dislike ads so much that I have them blocked in my web browser. (Yes, the irony of a blogger subsisting on the ads he hates has not escaped me.) As such I might be an outlier. But as I noted when I wrote about Readfy in November, this service has to walk a careful tightrope. It has to bring in the right amount of users, advertisers, and content, and failing on any one of those could doom this effort if Readfy isn't careful. I also have ads blocked. But I am also a blogger who accepts paid ads. And I wouldn’t want to read a book filled with ads. There are so many avenues for getting books (lending sites, freebies to download, the library) as a reader I just don’t see the need to go through a service like that. i dislike ads, but i love gmail and google search. i think it is about the trade off. if they have great books, and the ads are contextbased and not too intrusive, then why not reading for free.